Looks like you are close... and figured out the naming convention. If you are certain that BIOS is compatible, perhaps you just need to pass some command line parameters to force the flash.. Flashing should always be with admin rights, go to the properties of the .exe and check off "Run as administrator", I couldn't tell if that command prompt had elevated rights or not. I don't think they'll get any further because they lack the Board ID Mismatch override like that one version that crashes. I was gonna attempt to contact the person who modified that version, but it's too bad none of the versions here are able to do that + identify the board at the same time! I'll try and pick the most auspicious of the versions in this thread and link it to them (Vipeax is the username) with a request for the same kind of mod. ERROR: Failed to merge Inforom image. Edit: never mind, I figured out a way to force it to flash. 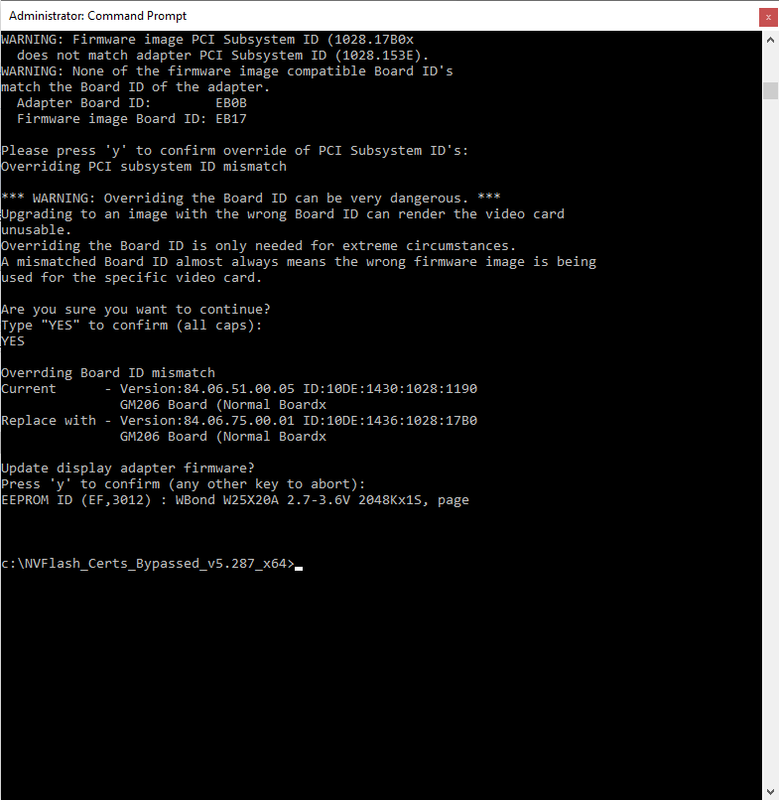 I flipped the BIOS selection switch after nvflash had verified the existing image but before erasing and programming, and then wrote known good ROMs to both positions afterward. The card is fixed. Last edited by terminx; 12-27-2018 at 06:53 PM. Nobody has cracked the code years later.. very surprised as just about everything else has been cracked/hacked.. There isn't much motivation either TBH, voltage doesn't seem to help Pascal scale so modding the BIOS is very limited as to what is can do to help in the first place. What PASCAL GPUs really need is more power and I guess a shunt mod can help there. Lastly, having the correct syntax is part of the equation however we've never been able to create our own signatures. Assume hulk commands are used in signing the BIOS but we don't have a way to generate the signature/license so having the syntax doesn't help. 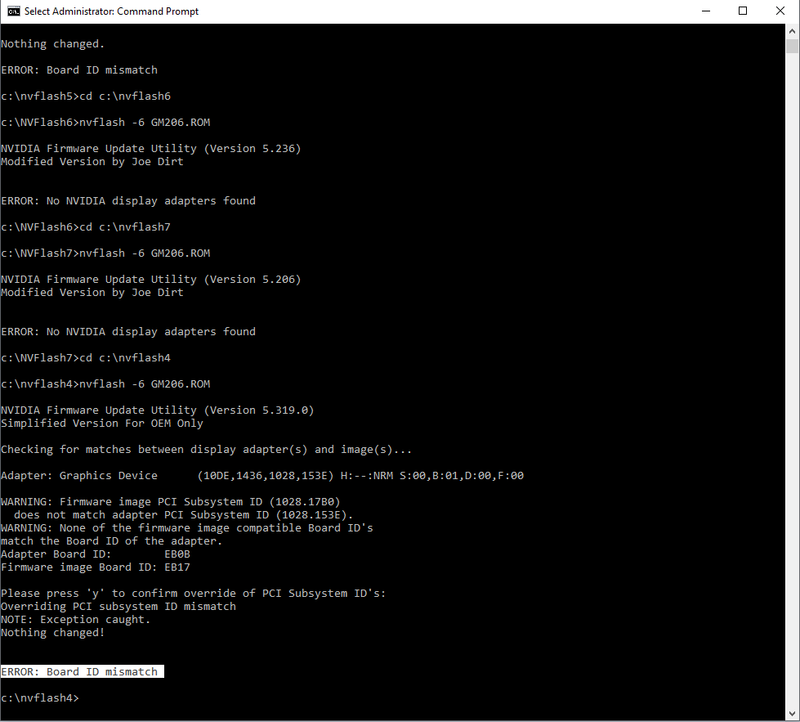 Flashing a signed BIOS is easy and doesn't require those commands. Actually I have solved my problem due to xoc bios, but some friends which have Lightning cards (xoc bios doesnt work correctly) needs to rise up power limit and its possible with Mobile Pascal TDP Tweaker but the problem is , after this modfication the bios can not reflash to card because of sing. There are lot of programmer but no one cant effort for hacking this simple flasher. By the way on the latest version of After Burner (v4.6), curve voltage limit rised up to 1.25v but I cant give voltage above 1.2v , I tried to locking 1.24v but noting changed its same on monitoring 1.2v (gpu-z and AB ). you have XOC bios, idk what you want more tbh, even running 1.2v on 1080ti's for daily use, degrade GPU after year and a half, with it u have no power limits and you can push voltage a bit too. pascal overclocks well enough out of box.